1 What is exactly a Kukri knife? 2 Some history knowledge about Kukri knife. 3 What are Kukri knives mainly used for nowadays? 4 What are the main materials of a Kukri knife? 5 How is a Kukri knife made? 6 What are the groups of Kukri knife? 7 Why should you buy a Kukri knife? 9 Who makes the Kukri knife? 10 What is the average price of Kukri knives? 11 How to choose the right Kukri knife for your purpose? 12 What factors should you consider before buying a good Kukri knife? 13 How to maintain the Kukri knife? What is exactly a Kukri knife? A kukri knife is a traditional Nepalese knife that is used as a basic utility knife as a part of the outdoor survival kit. 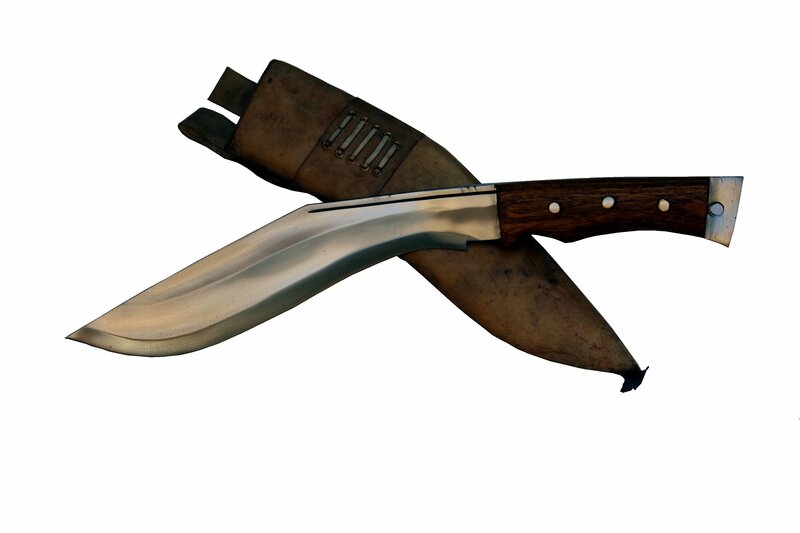 Although it is a multi-purpose knife, the kukri has been historically used by the Gurkha soldiers of Nepal. Some history knowledge about Kukri knife. It is estimated that Kukri knife first came into existence around 2500 years ago. The speculation is on the basis of its resemblance with the ‘Machira’; the classic Greek sword. Some experts suggest that Kukri originated in 13th century when the Malla dynasty came to power in Nepal. The first recorded use of Kukri in military combat was made in 1814 by the British who witnessed the deadly weapon while fighting the Gurkhas. What are Kukri knives mainly used for nowadays? The knife has proved its effectiveness in combat as well as in activities like chopping wood, hunting and also skinning. It can also be used for opening tin cans and clearing bushes and undergrowth. What are the main materials of a Kukri knife? Traditionally a Kukri knife is made up of high carbon steel that is obtained from recycling car and truck suspensions. The genuine kukri knife has a handle that is made up of buffalo horns, wood and metal. Other kukri knives are made up stainless steel. How is a Kukri knife made? The Kajo (Hilt), Chhapri (back of the handle) and Kothi (Metal Cap) are made out of metal on the basis of the order of the master smith. The sharpness of the blade is further enhanced by handmade tools. What are the groups of Kukri knife? Almost all the Kukri knives have the same characteristic blade shape. Even though their blades have the same characteristic inward curve, not all the Kukri knives fall into the same category. Kukri knives can be broadly classified into five different groups. The first comprises of the traditional kukris used by the Nepalese army. The second group comprises of kukri knives that are meant to be used by the Nepali native villagers for daily chores. These knives are used for civilian use. The third kinds of kukris are those that are manufactured by non-traditional methods. They are mainly used by Gurkha regiments of the Indian and the British army. These are machine-made and they have typical features like full tangs and slab handles. The fourth category consists of Kukri knives that are meant to be sold to tourists as memento. While buying a kukri it is important to identify the category in which the product falls. These types of kukris are not meant for easy-duty work. These knives usually have low quality and are available in the lower price range. Tourists knives are exported to several countries where they are sold in retail stores. The fifth category of kukri knives comprises of those kukris that are manufactured on a large scale using synthetic materials on an industrial scale. A major difference between non-traditional and genuine knives is that genuine Kukri knives are accompanied by two small knives called as Chakmak and Karda. Chakmak is a blunt sharpening tool while Karda is a small knife used for cutting and whittling. These knives are kept in the sheath and absence of these two pieces is sufficient enough to prove that the kukri knife is not crafted by traditional blacksmiths. Understanding different categories of kukri will help you to make the informed decision during purchase. Why should you buy a Kukri knife? A kukri knife has proved to be a good substitute for other heavy tools like machete, ace or a shovel. Hence, any hunter or adventure camper can harness the power of the versatile kukri knife to perform various activities like cutting, chopping, peeling and skinning. Besides, a small kukri knife can help you move with lightening speed when attacked by a wild animal. This is the current double-fullered Kukri knife that is being used by British Gurkha soldiers posted in Afghanistan. It is made by the Biswakarma blacksmiths who also make knives for Nepal’s indigenous Gurkha soldiers. So if you are looking for a well-crafted genuine Kukri knife then this is the model you should buy. It is around 16 inches in length and it is made up of high-grade carbon steel. The blade is very sharp and the handle is made up of Rosewood. The knife is so sharp that it can easily slash through a 2-inch thick forest wood. In fact, you can use it cut down a number of small trees. It can also be used as a good alternative for an axe. The efficiency of the blade can be attributed to its perfect geometry that has been carefully shaped under the watchful eye of the master smith. The knife weighs 1.76 pounds and it is accompanied by a karda and a chakmak. The scabbard is made up of brown-color natural leather. This Kukri knife is specially used for chopping wood in the wilderness. This powerful Kukri knife serves as a perfect substitute of an axe as it possesses extreme sharpness. This knife has a 10-inch blade and its hardwood handle is ergonomically designed. The design improves comfort while using the knife as an axe. This Kukri can be conveniently used as a hatchet to cut down tree branches that are 1 inch thick. Moreover, it can also be used to cut down logs that have the thickness ranging from 3 inches to 6 inches. The powerful grip ensures that the knife is used at its maximum efficiency. Moreover, the hardwood makes the knife look exquisitely beautiful. This sharp knife helps you to cut through the toughest wood in the forest. This versatile knife has proved very effective in its usage. However, it is recommended to get it sharpened by a random orbital sander for maintaining the sharpness. People who are not experienced in sharpening a Kukri knife must not try to grind the blade all by themselves. Additionally, this one pound knife has its own unique style of use and hence you must practice it well to get the hang of it. If you want an affordable Kukri for cutting down weeds or chopping small branches for firewood, then the Ka-Bar 2 is the right Kukri for you. 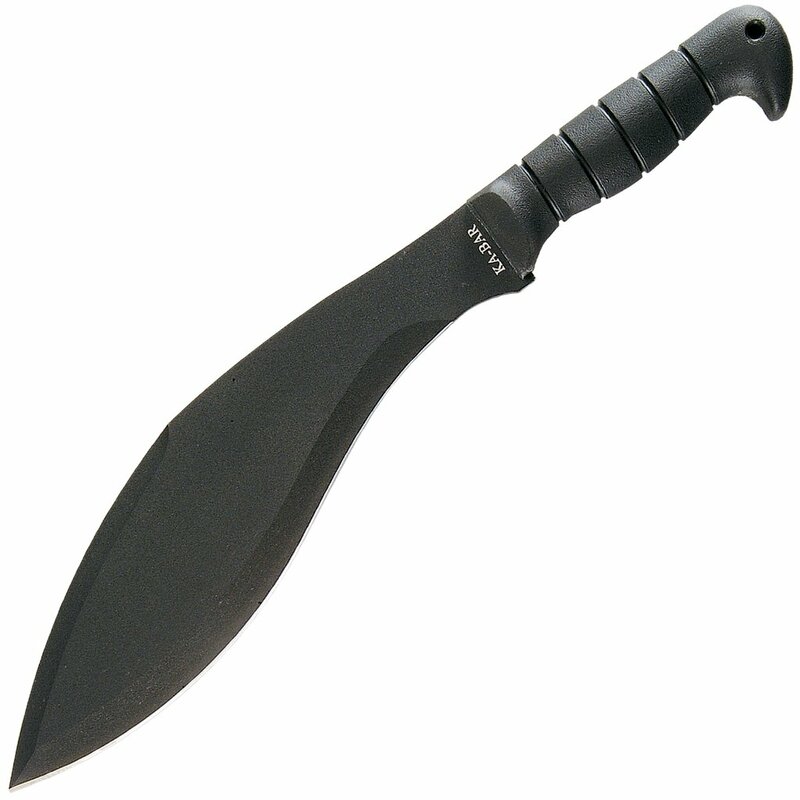 This Kukri is also suitable for clearing campsite in the wilderness. This Kukri knife weighs 1.7 pounds and it is made from black-coated carbon steel due to which it is extremely durable. The total length of the knife is 17 inches and length of its blade is 11.5 inches. The durability has been tested in the factory and the product has passed all the quality checks even in the harshest of the conditions. The black coating on the blade ensures that sunlight does not get reflected into the eyes when precision cuts are being made. The other benefit of the knife is that it provides a comfortable grip with grooves. The knife comes with a G handle that has grooves to give complete control over the knife’s movements. This product can be considered as an alternative to a small axe. It may not be considered as an alternative to a machete as most of the customers use it to gather campfire wood. So this knife can be considered as a versatile tool that can be an alternative for several small tools for daily chores. The quality is so good that it is considered to be a true value for money. This blade is for those who want a lighter yet longer blade. There are a number of shops available which sell kukri knives but there is hardly any shop that will have a kukri knife that is both, sturdy and light. The OKC Kukri Knife is a perfect choice for those hunters who don’t want to get tired while handling the knife. More specifically, this knife is apt for situations where you have to indulge in excessive cutting and chopping in the wilderness. Moreover, you can use the knife for longer hours without draining your energy. The knife weighs only 18 ounces and the black-coated blade has a length of 11.5 inches. The blade is made up of carbon steel due to which it is extremely durable. The short length makes this Kukri quick and deadly. Additionally, this knife is also known for its reliability. The OKC knife does not have any disadvantages but existing customers have suggested an improvement over its handle design to improve shock absorption capabilities. Moreover, this knife is a not a perfect Kukri knife but a perfect alternative for a larger Bowie knife. This model is perhaps one of the cheapest Kukri knife that can be exclusively used for heavy-duty cutting. This multi-purpose knife is called as a ‘workhorse’ and its price falls in the low. 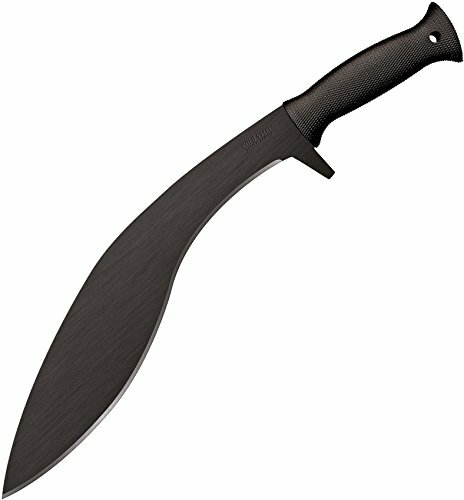 This Kukri machete has a blade that comes in two sizes, namely 13 inches and 17 inches. Both these sizes are sufficient enough to cut through the toughest wood that can be found. This kukri machete is a true value for money and it comes with a Cordura sheath. The knife has a blade that is 2.75 mm thick and its weight is 16 ounces. Even though it is considered to have the use of both, the hatchet and the machete, this Cold Steel Kukri is specifically used as a bush-craft tool in tropical and alpine environments. 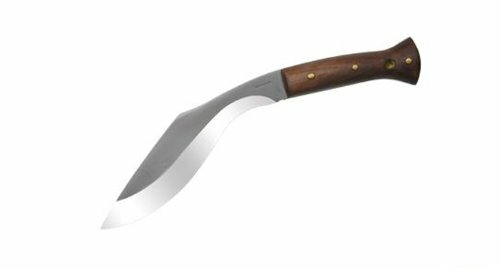 The Cold Steel Kukri is particularly used as a plowing tool that can clear even the toughest overgrowth and vegetation in the jungle. The knife has proved a perfect tool for creating a trail. This knife has a black anti-rust matte finish that increases its durability. The black coating ensures that you are not bothered by the sunlight while making a trail in the wilderness. The product must not be perceived as a substitute of ace or a wood-cutting tool. Additionally, it may not be suitable to use this knife for clearing thin jungle vines. Who makes the Kukri knife? What is the average price of Kukri knives? The average price of a genuine Kukri knife is around $30. The price of the product depends primarily on the blade material and the blade size. Moreover, industrially manufactured Kukris offer precision cutting and hence they tend to be costly. How to choose the right Kukri knife for your purpose? Most of the hunters will use the knife as a defense weapon as well as a tool that is critical for outdoor expeditions. Hunters who want to use the kukri knife as a weapon must buy a knife that is made up of carbon spring steel.It is recommended to select a knife with at least 2-3 fullers as these will lighten the weight of the weapon. The length of the blade also depends on the type of the attack. A blade that is less than 12 inches is suitable for quick actions and fast movements while a blade that is more than 12 inches is good for situations that require brute force. What factors should you consider before buying a good Kukri knife? Blade Material: The blade material is the most important factor that must be considered while buying a kukri knife. A stainless steel knife is cheaper and resistant to rust. However, it is less durable and loses its sharpness quickly. Carbon steel enables a higher degree of sharpness but rusts quickly if not maintained properly. Moreover, a kukri made out of carbon steel is more expensive. Your purchase decision must always be made based on the purpose of use. For example, a saltwater angler must use a stainless steel kukri because it will not be affected by rust-prone environment. On the other hand, people indulging in activities like camping and bushcraft must opt for a kukri made of carbon steel. It is important to note that carbon steel comes in different grades which need to be considered while buying the knife. Blade Shape: Once again, the functionality has to be kept in mind while deciding on the blade shape. A kukri comes in various shapes and every blade shape has a specific purpose. Other than combat, a kukri can be either used for either fine cutting or rough cutting. Some other people may want to use the knife for chopping, slicing and skinning. Gardening enthusiasts may even perceive the knife as a terrific tool for digging. There are a variety of blade shapes namely, drop points, spear points, dagger points, tanto, sheep’s foot, clip point, recurred kukri-style. A drop point or a clip point kukri is appropriate for hunting while a machete-shaped blade is good for bushcraft and chopping. Tang: Kukri knife is mostly used for heavy-duty and hence it is advisable to select a full tang knife. Full-tang knives are usually expensive but they are durable. Tangs of a half-tang kukri tend to break when they are repeatedly used to cut or chop thick objects. Handle: A kukri can be used effectively if it has a good grip which depends on the material of the handle and the comfort level offered. Traditional kukri knives have handles that are made of wood and rubber while more popular models use materials like G10 and Micarta. Buyers need to check whether the knife is slippery and whether he fits well in the hand. Using the knife in rains tends to make it slippery. Sheath: It is not feasible to carry the kukri knife in your hand the entire time and hence you need a sturdy sheath that will not only hold the knife but that can help you secure the blade when not in use. The length of the sheath must depend on your height. This will allow for easy maneuvering. Most importantly, the sheath must hold the blade securely and tightly. How to maintain the Kukri knife? Clean the knife blade with machine oil or gun oil. Make sure that you apply the oil at least once in a month. Avoid leaving any fingerprints on the knife after the oil is applied. It is critical to clean the blade if rust has developed. The blade can be cleaned with gasoline and the rust can be removed by using fine sandpaper. Appropriate polishes have to be used for cleaning parts other than the knife blade. Use shoe polish for leather casing and furniture shine for the wooden handle. Brass fitting and silver casings must be polished by polishes like Brasso and Silvo respectively. The kukri knife is to be stored in dry and normal room temperature. Keep the knife away from moisture. Any carving on the knife must be scrubbed with gasoline and a hard brush. Avoid exposing the leather sheath for the longer duration of time as it may shrink due to over-exposure. A kukri knife has always been associated with bravery, valor and adventure. Today, it has become a necessary tool in the camping kit of any hunter or adventure enthusiast. However, many people are not aware of the different types of Kukri knives that are available. Different Kukris exist for different purposes and for different customer groups. This article throws open the detailed world of the famous kukri knife. It serves as a perfect guide for anyone desirous to buy a Kukri knife.